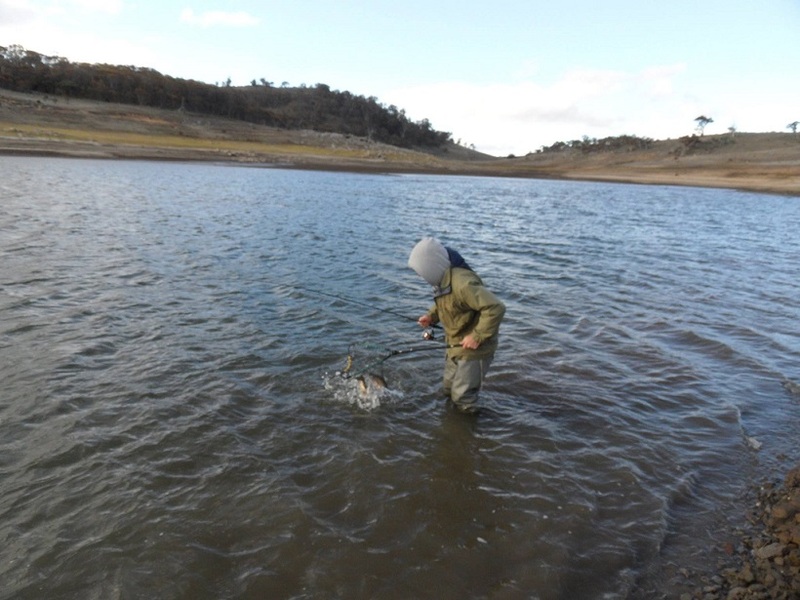 Dad was keen to check out Middlingbank on Lake Eucumbene today, so after lunch we packed our gear into the car, and set off. On the drive to the lake I noticed the wind was blowing pretty hard, well noticeably so, as I don't normally see its affects until I get close to the lake. Ohh well, another cold, blowy afternoon ahead, but hopefully we could use that to our advantage, and score some muddy water Browns. On arrival, the large point which the village of Buckenderra is situated on provided a little bit of shelter from the full on strength of the wind. It was still windy, but no wear near as bad as areas where there is nothing to get in the way of its power! We set out, heading straight down to the shallow, muddy bay which has yielded some nice browns recently. We began prospecting the bay with silver wobblers, and it didn't take long for mine to get some attention. I was casting a muddy water line along the edge of the bay, when out of no where, just as I was about to lift the lure out of the water, a nice sized brown emerged from the murk, and had a slash at the silver, shinning piece of metal. I had to react quickly, and kept the lure in the water with only about 30cms of line hanging from the end of my rod tip. I kept the wobbler swimming, and watched as the fired up trout kept chase, and grabbed the lure. I struck, but with such a little amount of line dangling from my rod tip, the chances of hooking up and staying connected were slim at best. That was cool to see though, and at least the fish were here, and fired up. I kept casting along the muddy water line, and it wasn't long before, whack! A fish grabbed the flicking, wobbling, lure. I saw a big boil, and felt the pressure of a decent fish. It was short lived as it promptly spat the hook, and shot off. Dam! I was keen to open the account, but it wasn't to be. As dad, and I rounded the point, the wind was pushing straight in, and was significantly stronger. We fished the wave washed area for a while, and it wasn't until I had rounded the point into the next bay, that I heard dad sing out, I got one! I looked back to see his rod tip bent over, and a fish throwing some water around into the air. I began to walk up, as I thought he might want a picture of it. As I neared him, he had it off the hook, and chucked it back it...ohh well I guess he didn't want a pic. It was just a small brown, but at least he had abolished the chances of a donut...for him.. I kept moving down into the bay we had just rounded the corner into. The muddy water line wasn't anywhere near as prominent here as the previous bay due to its orientation to the wind, but there was a small one to focus my casting on. I was nearing the end of the bay, and still casting up hard along the bank in front of me, when I put in a cast about 2 metres out from the bank, and was bringing it along the muddy water line, when whack! The wobbler stopped dead in the water, and took off out to open water. I lent back on the rod, wanting to make sure I had a good hook set as the fish took off. I could feel it shaking its head as it peeled some line from my spool. It began swimming towards me, and I quickly regained a lot of line. As it neared me, it obviously didn't like the look of me, and attempted to swim away. I didn't want a bar of that, and kept a constant, but only mildly firm pressure on it. I could see the wobbler poking out the top of its mouth, over its top jaw. I was fairly confident I had a good hook set, and settled into enjoying the fight. This fish didn't want to be netted, as it did the typical brown trout fight, keeping at arms length, and not wanting to give in. We dogged it out for some time, before I had it close enough for a safe netting. As it slid into the net, I was highly relieved, and pretty happy to say the least. Dad got a couple of quick pics, before I had it back in the water, and soon swimming free. It was a very healthy, well conditioned fish, and we estimated it to be in the 4.5-5lb range. Ohh what a feeling! After loosing the monster yesterday, I was keen to get a good one today, and this one didn't disappoint. It was no double figure fish, but a great one that I thoroughly enjoyed catching. 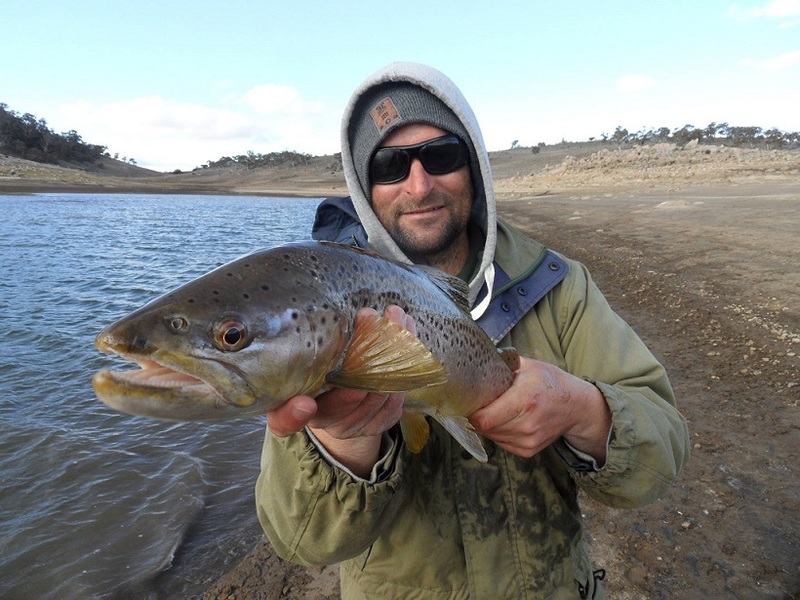 Caught these 2 Brookies ,Flyfishing Lake Jindabyne Fishing Woolly Buggers in the afternoon & evening near Widow,s Creek. Also 3 club members caught 10 Rainbows to 2lb, 1 Brown 2&1/2 lb, and another small Brookie, over 5days. Best areas were Creel Bay ,Westons Bank & Widows Creek. The Brookies were 2lb 8oz & 4lb 3oz .